Combine the cup of flour, oregano, salt, mustard, garlic salt, and pepper in a medium size bowl. Slowly pour the beer into the dry ingredients, mixing with a spoon. If the batter seems too thick, add a little more beer. Rinse and pat dry the pieces of tilapia. Heat a deep fryer to about 350 degrees F. If you don’t have a deep fryer, a Dutch oven with 3 inches of oil. Add the flour to a plate and, one piece at a time, dip the tilapia into the flour, smother it in the beer batter, and place it in the hot oil. Cook the battered fish until golden brown on each side. While the fish is cooking, combine the mayonnaise, plain yogurt, and chopped cilantro. Stir this mixture until it is completely blended. Heat up a skillet over medium heat and place the corn tortillas inside, warming them and making them soft. 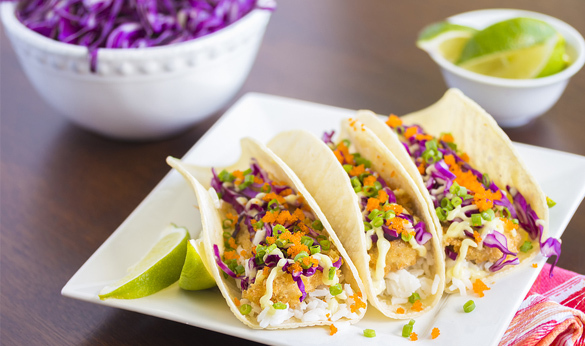 Now, complete the fish tacos by putting the tilapia on the tortilla, followed by the white sauce, salsa, cabbage, and a squeeze of lime over the top.